| New York, NY - October 11, 2018 | Wolf-Gordon introduces a new collection of highly durable, stain resistant textiles with versatile patterning. Artistically bright, lively colors define the new Woven 03 collection, making its debut with seven patterns: Barrington, Brio, Checkmate, Gabrielle, Marl, Radiator, and Static. The simplicity and organic nature of the heavyweight weaves and chunky wovens complement the balanced patterns and multi-toned effects. Barrington: Barrington is a heavyweight textile with a beautiful hand, achieved with polyester yarns that are 78% post-consumer recycled, meaning less energy and waste is incurred in the manufacturing process. High-voltage “Fuchsia”, “Chartreuse”, and “Canary Yellow” help establish a point of focus; earthbound “Yam”, “Amber”, and “Leaf Green” embrace the elements of nature; and jewel-toned “Garnet”, “Turquoise”, and “Sapphire” have a lasting appeal. Brio: Reminiscent of soft waves of water, Brio is an undulating pattern with a soft chenille feel. Each of its colorways convey a specific “energy” according to feng shui principles: red, when used with discretion, brings joy and excitement; orange is used to promote social interactions; green, the color of renewal, introduces the beauty of nature when combining different shades; blue, an expression of the water element, brings a sense of relaxation and healing; black and charcoal hold the energy of power and add depth and definition; and silvery gray is sharp, clear, and reflective. 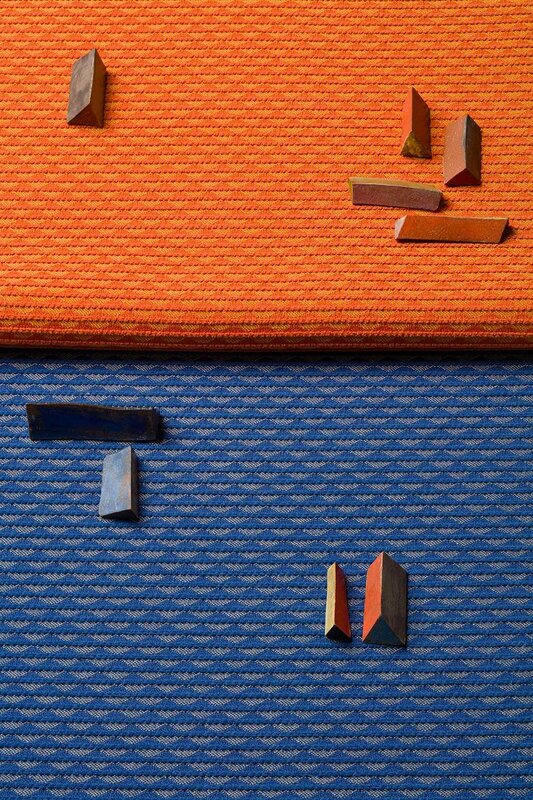 Checkmate: A playful geometric upholstery design formed from a checkerboard pattern that alternates between squares divided into sections of thick and thin stripes, Checkmate has a solid color twill-weave punctuated with random striped segments. Multi-color yarns are integrated into winning combinations on concentrated shades of aquamarine, crimson, cordovan, cobalt, and charcoal. Gabrielle: Named for French fashion icon Gabrielle “Coco” Chanel, Gabrielle is woven with 100% polyester and treated with a stain resistant finish, using a variety of yarn types in both the warp and weft to maintain much of the unique character of the original tweed influence. Along with several warm neutral blends, jewel tones of “Ruby”, “Lapis”, and “Peridot” are included in the color selection. Marl: Aptly named for the multi-toned color effect often seen in knitted sweaters and scarves, Marl has an eye-catching appearance. Produced by lightly twisting two or more fibers of different colors together, the yarns in this pattern yield a subtle, mottled fabric with the feel of a silk and linen blend. “Eucalyptus” combines brilliant hues of turquoise, lime, and olive; “Paprika” sizzles with red, orange, and gold tones; and purple, blue, and sepia coalesce in “Lilac”. Mottled neutrals include blends of grays, chocolate browns, and heathered oatmeal. Radiator: Whether warming a room, cooling an engine, or dispersing heat from electronic components, radiators are important devices in a variety of environments; similarly, this high-performing polyester/nylon blend upholstery textile will function well in a variety of seating applications. The energetic pattern, constructed of stripes broken into varying grids, is offered in multicolor combinations of vivid red/orange/gold, cool lime/turquoise/cobalt, warm tan/sienna/ burgundy, and two sophisticated neutral blends. Static: A multicolor, speckled quality is featured in Static, a high-performing upholstery textile that substitutes polyester for soft wool and uses a nylon warp. Acrylic-backed with a stain-resistant finish, the colorways include vivid hues of “Crimson,” “Flame”, and “Amber”; cool “Spruce”, “Aquarium”, and “Denim”; three neutral blends; and a shadowy “Midnight”.